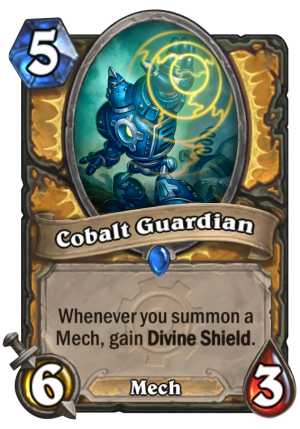 Cobalt Guardian is a 5 Mana Cost Rare Paladin Minion Mech card from the Goblins vs. Gnomes set! Whenever you summon a Mech, gain Divine Shield. Guardians used to be built out of Adamantium, but production got moved to Gadgetzan and Cobalt was cheap. Rating: 2.0/5. From 71 votes.